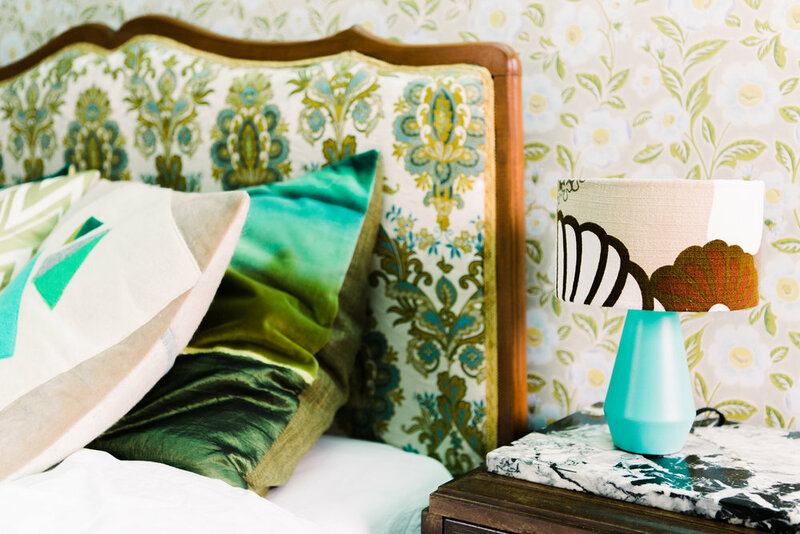 I create relaxed and uplifting interiors using your existing furniture and textiles. I am highly skilled at layering different patterns and styles so they sit harmoniously together, creating individual and lasting interiors – places to feel good about and happy in. Enjoy a home consultation, or if you live further afield you can discuss your decorating plans with me online. Together, we’ll establish your individual style and create a mood board and detailed specification that reflects this. We’ll talk about your needs, interests and priorities and how you want to feel in your new space. Using my unique skill set, my priority will always be to revive and re-imagine your existing belongings. Following your consultation you will receive drawings and a written specification detailing colour schemes, fabric, wallpaper and furnishing designs. A one hour consultation within 20 miles of my South Oxfordshire studio or online, is priced at £125. Any further design or consultation fees will always be agreed and confirmed before any work is undertaken. To help you make the most of your consultation please contact me for a free, initial chat about your requirements. I breathe new life into your existing furniture. Transforming the dated, damaged, bland, or plain unsightly into something you will love and generations to come will treasure. PLEASE contact me here for a no obligation quote. These are individually handmade to perfectly fit your space and reflect your loves, interests and ideas. I take great pride in everything I create and work quickly, cleanly, and efficiently to ensure each project is completed on time and within budget. From £150 per square metre. “I was in desperate need of some professional help and guidance with improving the look, vibe, and identity of the multidisciplinary and chiropractic clinic I took over two years ago. The clinic felt impersonal, cold and unwelcoming- not a friendly place to be or work in. Emma met me at the clinic and we walked through the space and discussed the route a new patient would take on the start of their journey with us. With Emma’s friendly and expert guidance, amazing eye for detail and very high standards of craftsmanship we have implemented a number of changes that have totally transformed our client ‘welcome area’.